About a year ago, when I dug the last garden beds, I cut and piled the turf upside-down in this great mound. 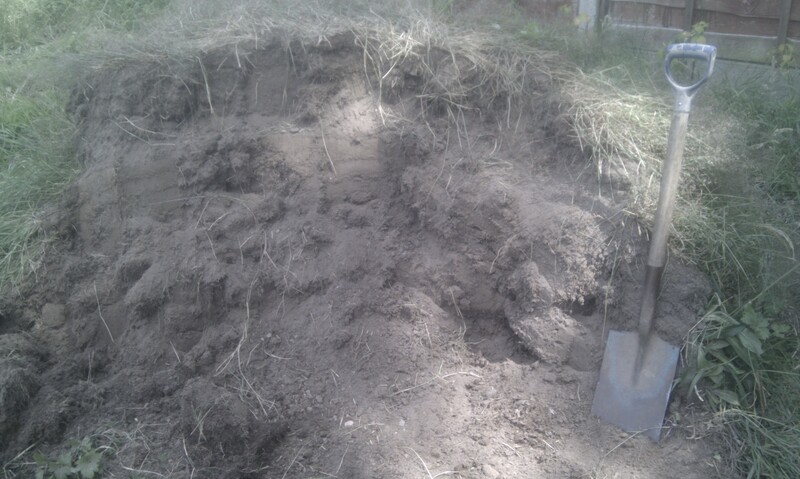 In theory this was supposed to break down into nice rich soil, with no trace of the grass left. In reality I have a very dry pile of turf pieces. The grass is dead but has hardly broken down at all, I’ve been using the pile to fill in the bottom of the latest beds I’m digging so it’ll probably finish its decomposition there, but it’s fair to say that this experiment has been a bit of a failure. 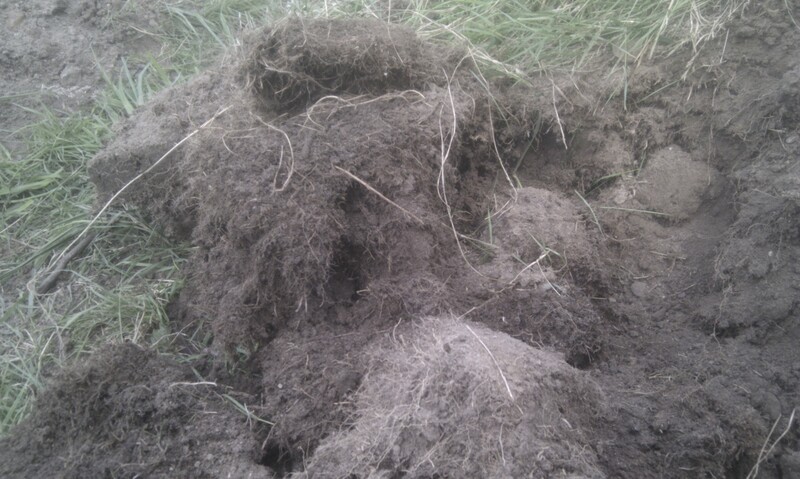 In future I’ll either dig the turf straight into the bottom of my double-dug beds, or if I’m making a pile like this I’ll make sure to keep it damp and see if that helps. A good weekend of digging! A busy spring has left us a little behind on the garden, with far fewer crops ready than we had last year. I also hadn’t made any progress on completing our garden beds. 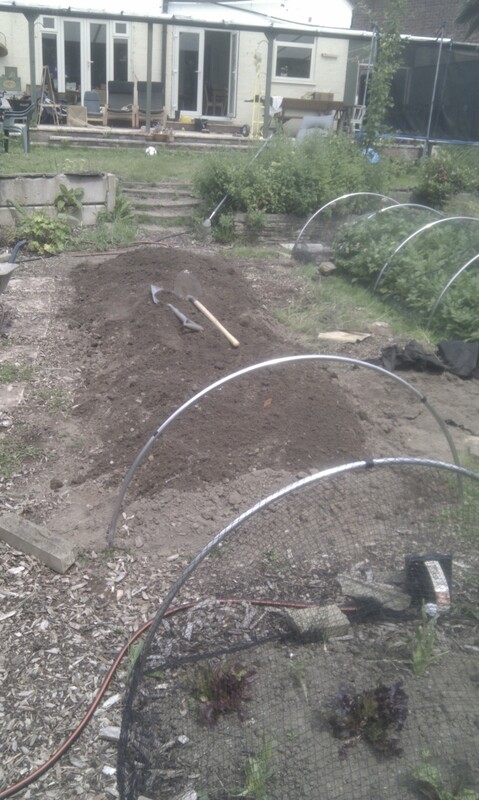 Since last Summer we’ve had 375 sqft dug of our proposed 800 sqft (eight 100 sq ft beds). I haven’t had a decent chance to dig any more for this year’s planting, but that all changed this weekend. Fortunately I had laid some weed-proof fabric over the area for the next two beds, and so, since Autumn, the grass, moss and weeds had been slowly dying back. When I peeled this back earlier in the year the grass was still surviving, but yesterday it had all gone! Digging this bed was so much easier than the previous ones. The remaining grass roots made the top layer a little difficult, but nothing like trying to get through turf. I also used a different technique for the digging too. Previously I’ve removed the turf and stacked it separately, but it’s been suggested by some of our visitors that it’d be better to put it straight into the bottom of the area I’m digging. I’m double-digging these beds so that’ll mean the remaining roots and weeds will be about two feet down, so they should just break down nicely, with no chance of them re-colonizing the bed. We’ll see! Now I just have to work out what to plant in it! At the moment it looks like our new Broccoli patch, to be followed by our winter veg bed. Now this is a bit of a quirky inclusion to our library – it’s directly reprinted from the 1940’s edition, and so is not the most up to date, but I do have a bit of a thing for wartime cooking and gardening books. When originally published, this was the Government-supported manual designed to turn us into a nation of growers. As a result it is a surprisingly good, down-to-earth guide to becoming a productive gardener. It covers everything you’d expect: Planning crops, tools, all the different vegetables, fruit and flowers, pests, poultry, bees, and how can you resist a book with a chapter entitled “Rabbits for Flesh & Fur”. As well as being a good basic intro to traditional gardening techniques, its extra dimension is that of thrift. In these austere times, learning how to garden frugally is a great skill, and so this book is elevated beyond novelty purchase and into a (mostly) serious part of our library. In fact I’m just off to re-read the sections on Bees & Chickens now! I got our copy for £1 from a discount bookshop, but you should be able to get them from your local bookshop or it’s only £2.80 from Amazon – follow this link –Make Your Garden Feed You , and the Trafford Eco House will get some money from your purchase (it won’t cost you any more). This book is one of my guilty little secrets! How can anyone be really serious about gardening with a book from Reader’s Digest? Now that the secret is out however, I have to say that if I could only keep one book from our library it would be this one. It has everything you need to know, about almost every type of fruit and veg that you’re likely to grow. It’s simple, clearly laid out, well indexed, packed with great pictures and illustrations, and very very unpretentious. My only criticism is that it could have done with being more comprehensively updated from the 1977 original. There a several newly-fashionable plants you won’t find in here, and there is an over-dependence on chemical solutions that you don’t tend to find in most modern books. So, as you may have guessed, this book is another one to buy. Don’t bother with getting a copy from the library – I did initially, but went straight out to buy one as soon as I had the chance. Please order it from your local bookshop, but if you have to buy it online please follow this Amazon link – Food from Your Garden and Allotment , and the Trafford Eco House will get some money from your purchase (it won’t cost you any more). Slowly I’m catching up with all the fun things we’ve been up to this year. 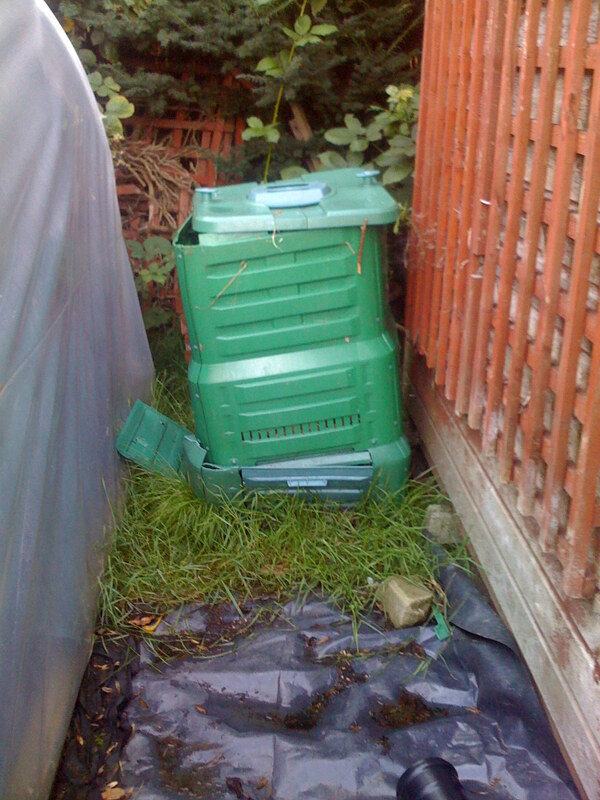 Back in August the old plastic compost bin we inherited with the house finally started to collapse, leaving us with a leaning-tower-of-compost. 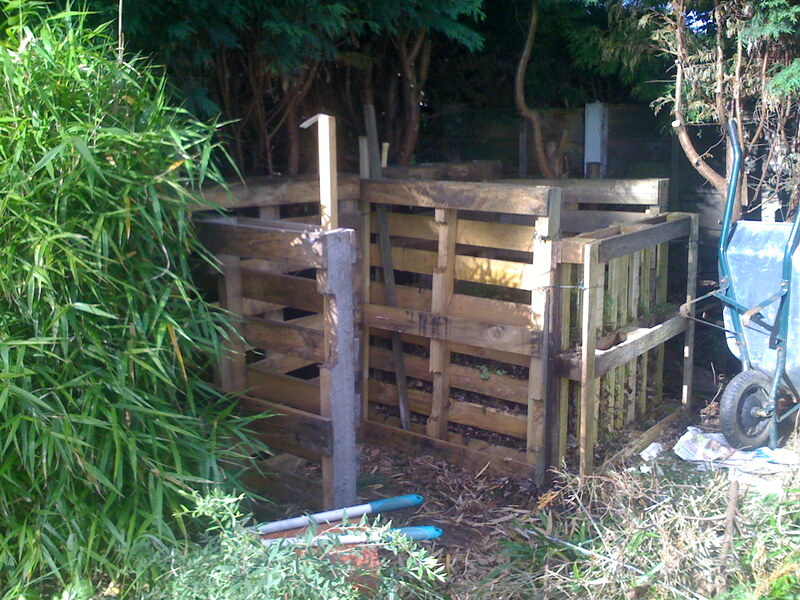 Compost is such crucial food for our depleted soil we decided that a serious solution was in order. 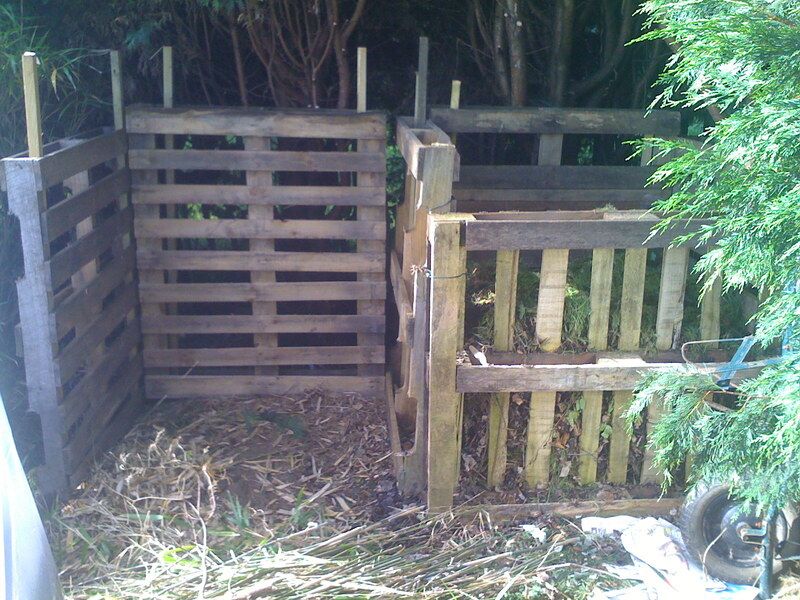 I’d heard about people building compost bins out of pallets, so we gave it a go, with the help of this “How to build a compost bin from pallets” tutorial from Gardeners World, and the left-over Aquaponic gravel pallets. They’ve been great – we have one-and-a-half full, so nw we’re just waiting to see how the first lot turns out. I already have plans to add a third!